New London has become one of the Northeast’s first multi-modal transportation centers. All at one location, adjacent to the restored Union Station, are connections for trains, buses, ferries, taxies and rideshare services. New London Union Station is located on the Northeast Corridor, is the busiest railway in the U.S., and is the primary railroad station in southeastern Connecticut. Amtrak trains operate along the Connecticut shoreline between Boston, New York, Washington D.C., and beyond. The New London based year-round ferry system links New London with Orient Point, Long Island, Block Island, RI and Fisher’s Island, NY. 1.3 million people utilize the ferry system annually, with 58 arrivals and departures daily during peak summer travel season. New London is ideally situated between many major market areas in the country. By road, New London is approximately 2 ½ hours from New York and less than 2 hours from Boston. 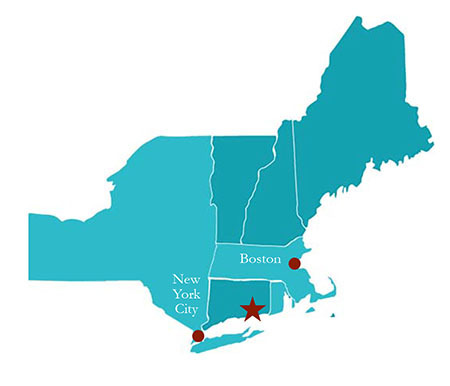 New London is also within 1 hour drive to New Haven, Hartford and Providence markets. Highway access to interstate I-95 is within minutes from any location in New London. Other major routes serving New London include U.S. Route 1 and State Routes 32 and 85. Additionally, New London is near State Routes 2, 12,156, 184 and 161. From June to September the Heritage Trail water taxi service links downtown New London, Fort Trumbull and the City of Groton/Fort Griswold. Groton-New London Airport, across the Thames River- 15 minutes from downtown New London, services the business and general aviation demands of our region providing infrastructure and aeronautical support facilities for corporate jets, and multi- and single-engine aircraft operators. T.F. Green International Airport is 45 minutes away in Warwick, RI. Bradley International Airport in East Granby, CT is about an hour and ten-minute drive from New London.